Ever hopeful, I once again joined thousands across the globe to watch the Perseid meteor shower. A group of us from the Edmonton Outdoor Club arranged to meet at the Clifford E. Lee Nature Sanctuary, just southwest of Edmonton, Alberta. This was far enough out of the city to leave behind the interference of city lights, yet close enough for us to get to without a lot of planning and preparation. We packed along chairs, water bottles, and flashlights. It was a short walk along a boardwalk, built above the sanctuary’s grasses. We set ourselves up at two of the observation areas, those of us without chairs lying down on the wooded structure to better view the sky. The sky was clear, the full moon bright. Within minutes of settling in, the clouds appeared, slowly covering the sky. Even the moon was obscured at times. In between brief patches, we were able to spot a few stars. 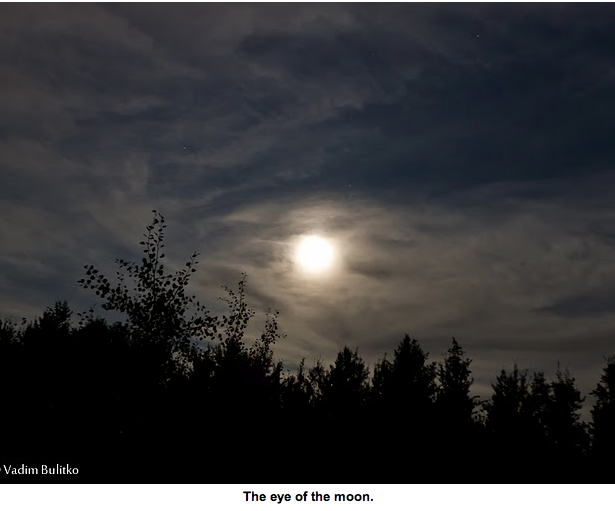 “Eye of the moon” photographed by Vadim Bulitko. Since we were in northern Alberta, the sky stayed lighter late into the evening because of the long days. Then we had the full moon to keep the sky lit. It was difficult to see even a few stars. But, we stayed, hoping to catch a glimpse of just a few meteors. I could have easily sat and just listened to the darkness. It was peaceful and relaxing. There were no horns honking, no traffic noises, no loud music from someone else’s vehicle. Just the darkness and the muffled voices of the group. Darkness and stillness do have sound. It’s very quiet and you have to be exceptionally quiet and still to hear it. It’s the type of sound that enters you through all your senses, not just your ears. It’s the type of sound that settles into your soul. A shout went up as someone spied a meteor streaking across the sky. They didn’t come fast and furious. Just a few sporadic ones here and there. The moon outshone most of them. The clouds moved around, giving us glimpses of the sky where we could see a few meteors. We were not the only ones dealing with cloudy skies. An individual in Surrey, England waited in her backyard for a glimpse of the meteor shower through the clouds threatening her viewing pleasure. If you would like to see what she was able to capture on her camera, visit: http://www.space.com/12630-photos-perseid-meteor-shower-2011.html. The group I was with spied seven meteors. The other group, at the second observation deck, spied 19 in the same time frame. It all depended on where in the sky you were looking. In addition to spotting a few meteors, we also saw the International Space Station. At first, we just thought it was an exceptionally bright star, until we could see that it was moving across the sky. Another bonus for our willingness to wait patiently and watch. My group left shortly after midnight. We knew that the best show was still to come, but some of us had to get back home. We were satisfied with the few that we had seen. Everyone in our group had seen at least one of the meteors. For some of us, it was the first one we had ever seen and that spotting was quite exciting. According to NASA, the Perseid meteor shower has been observed by hopefuls the world over for over 2,000 years. The meteor shower is caused by the earth’s orbit through the debris of the Swift-Tuttle comet. This comet orbits the sun once every 133 years. Every August, the earth orbits through the debris left behind by the comet. Some of the debris is over 1,000 years old. As the tiny bits of Swift-Tuttle hit the earth’s atmosphere at nearly 133,200 mph, they burn up and provide us with a spectacular meteor show. What's that at the bottom of my purse?